I had some bead left over from some earlier projects so there was nothing to pick up. 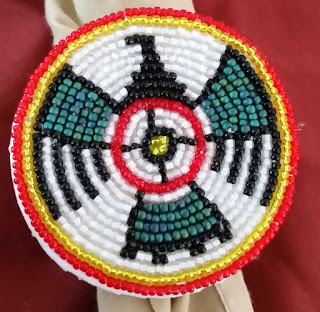 Just a needle, thread, and piece of white cloth and I was on my way to beading. I forgot how much I enjoyed this kind of methodical building but as I remember it was a trying time at work and was a good release. Once finished I glued it to a wooden round and have a wooden loop for the neckerchief.